From a standard trifold brochure to a 28" oversized trifold, we'll help you create a marketing piece that stands out from the rest. We offer 11x17 or 12x18 printing for your most common projects. Or, print up to 28" wide to accommodate a 3 panel brochure with each panel a full 8.5 x 11 sheet size. Imagine the impact your brochure will have when you hand out this custom look piece. 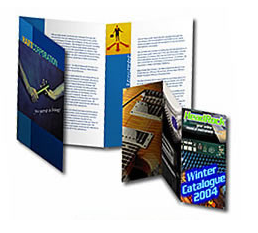 Even better, since our brochures are digitally printed, you can order just what you need. 50, 100 or 250 are no problem. We can also add variable content so each brochure is unique with the recipient's name or other info. If you don't see what you're looking for, we'll email you a quote.